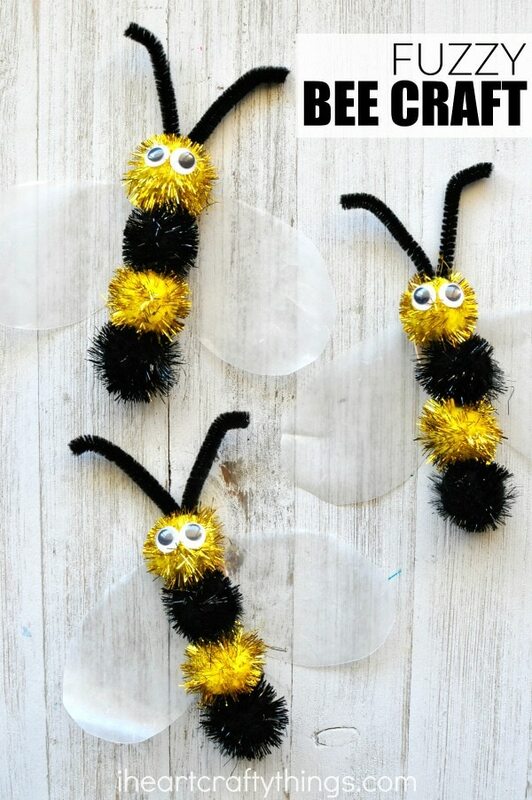 This darling fuzzy bee craft is perfect for a spring kids craft in the next coming months as we say goodbye to winter. In fact, all of our plants and flowers are beginning to grow again and we are super excited to re-welcome all of the bees in our neighborhood. 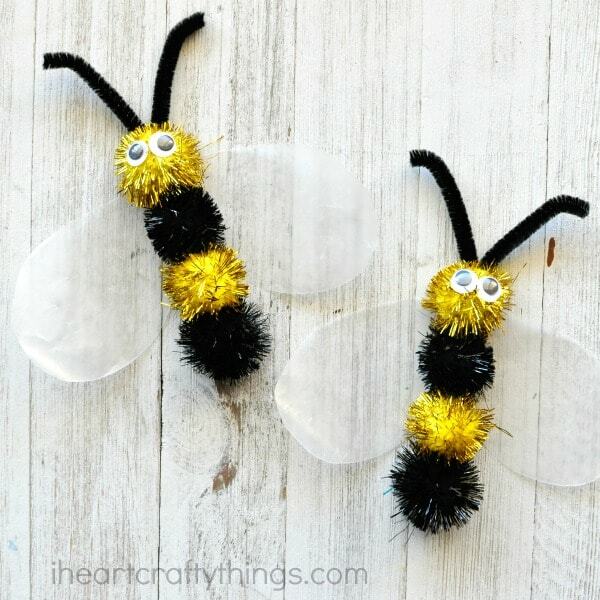 Grab some fun bee books (look for some recommendations at the bottom of this post) and have an afternoon full of fun learning about bees and making this cute fuzzy bee craft. 2. Glue your glitter poms onto your scoop stick in a yellow/black/yellow/black bee pattern. We used four 1-inch poms to fill our scoop stick. 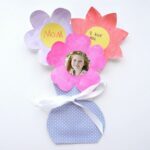 You could also do this with a craft stick and just a few additional poms. 3. Cut your black fuzzy stick to make two antennae. Use your hot glue gun to glue them at the top of your bee behind the first yellow glitter pom. Bend the ends of your antennae slightly. 4. 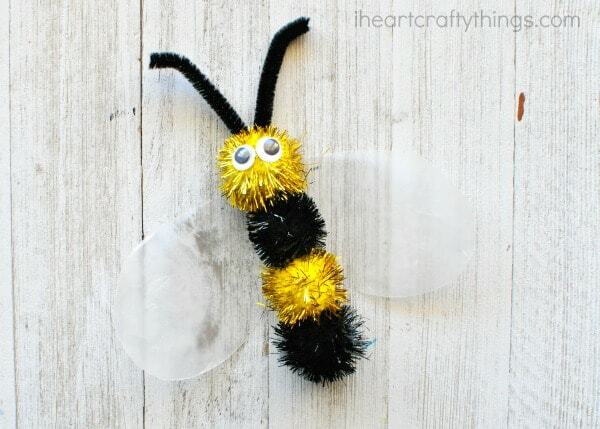 Use your hot glue gun to glue your wiggly eyes onto your fuzzy bee craft. 5. Cut bee wings out of your wax paper. 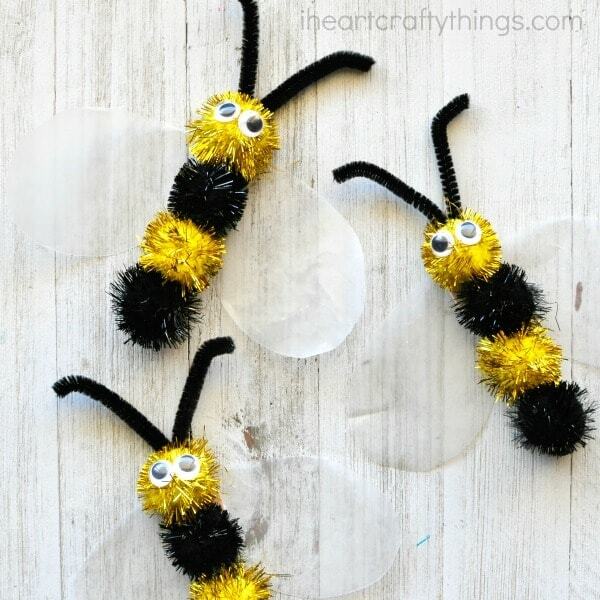 Use a hot glue gun (or tacky glue) to glue the wings onto the back of the scoop stick to finish your fuzzy bee craft. 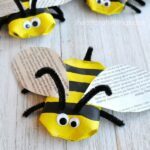 Looking for more fun spring insect crafts? 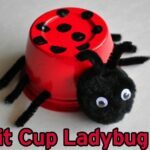 You’ll love our recycled bee craft and paper bowl ladybug craft. Also make sure to check out our gorgeous watercolor butterflies and shimmery dragonflies! It’s so cute. I love it !! !